An unprecedented rise in female donors to political campaigns, fueled largely by opposition to President Donald Trump, continues to grow in the run-up to the 2018 elections. The number of women donating to federal candidates has surged by 182 percent when compared with this time in the 2016 cycle, according to new data from the nonpartisan Center for Responsive Politics. Much of the activity has been among Democratic donors, a trend that first began to appear after the Women’s March on Washington the day after Trump’s inauguration. The number of women who are donating in smaller amounts, but enough to trigger the $200 threshold requiring disclosure to the Federal Election Commission, is even more dramatic: up 422 percent over 2016, the center’s data showed. By this point in the 2012 cycle, about 133,000 women had donated to federal candidates, the center found by using software and research to determine the gender of most donors. 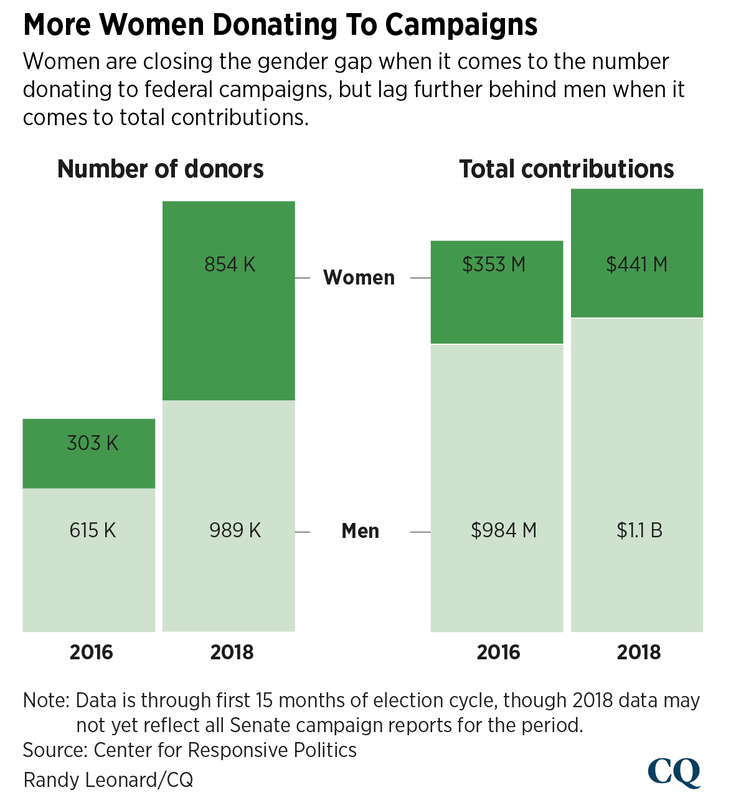 So far this cycle, more than 850,000 women have donated to federal candidates and political action committees, almost double the number of female donors Roll Call first reported last year. In total, women account for 46 percent of all donors this cycle, up from 33 percent in 2016. Republican candidates and fundraisers say they have stepped up outreach to female donors on their side of the aisle, too. The new group Women2Women PAC is supporting at least three major candidates, including South Dakota Secretary of State Shantel Krebs, who is running for the state’s at-large House seat, Danielle Varallo Stewart of the Republican Main Street Partnership said in an email. The rise of female political donors parallels a similar surge in the number of women running for elective office and has prompted a change in campaign finance rules allowing candidates to use their political money for child care in some cases. So far, 657 women have made a run for Congress this campaign season as a major party candidate, the Center for Responsive Politics found, compared with 355 in the 2016 election. Men are still running for Congress in higher numbers: 2,215 male candidates for 2018 compared with 1,772 in the last cycle. Male donors are also increasing their participation in the campaign finance system by some 60 percent this election cycle, with nearly 1 million men so far making a political contribution in a congressional race, compared with about 615,000 at this point in the 2016 cycle, according to the center’s data. The female donors this cycle are giving 55 percent to Democrats, while the men have given their money in an even split between both sides of the aisle, the center found. “Women are willing to spend more money this year than they normally would,” said Anne MacMillan, a Democratic lobbyist at the firm Invariant. MacMillan, along with a collection of other like-minded women in Washington, is part of the Jenkins Hill Society, an all-female network that raises campaign money for Democratic female candidates. The group has expanded its initial incumbent-focused donations to now include challengers, MacMillan said. Now, in addition to raising money for vulnerable Democratic women in the party’s Frontline program, such as Rep. Cheri Bustos of Illinois, the group has also raised campaign cash for non-incumbents such as Abby Finkenauer in Iowa’s 1st District and Chrissy Houlahan in Pennsylvania’s 6th. “There are just so many candidates that are so good, and there’s such a legitimate chance that Democrats will take back the House or the Senate or both,” MacMillan said, adding that the group is about more than just dollars. “Women are looking for other women to band together with and push back on the things they don’t like, including the lack of civil discourse. We are sharing those experiences and figuring out how you make the biggest impact together,” she said. The increasing number of donors and candidates, both female and male, this cycle may potentially end up helping to shatter previous records for the most expensive cycle, Bryner said. The average amount raised for a winning House campaign in 2016 was $1.7 million, while a winning Senate bid averaged $12.8 million. Conservative groups say liberals aren’t the only ones with motivated donors. Lobbyist MacMillan said that even for Democratic donors who are already hitting their budget maximum, it’s hard to contain the enthusiasm, especially after upset victories such as now-Rep. Conor Lamb’s capture of a previously Republican-held Pennsylvania seat. Randy Leonard contributed to this report.